We never did get to see how well Alonso would go after such a promising practice; his engine died in Q2 and the Spaniard was left frustrated in 15th position. The F1 gods can be very cruel at times. Instead, we had Raikkonen and Hamilton flirting with exclusion from Q3, Lewis especially cutting it extremely fine to be tenth at the end of Q2. I do not know whether the McLaren team like to live on the edge or this is pure coincidence, but they do seem to make some strange tire choices these days. For the sake of my nerves, I wish they would settle for the straightforward. It was all the likely contenders (except Alonso, of course) in Q3, however, and Hamilton made immediate amends by trading fastest sector times with the Ferraris. In the dying minutes he put the McLaren on pole, only to see Massa take it back with an excellent last lap. Kovalainen had been quick in all sessions but faded a little to be beaten by both Raikkonen and Kubica in the end. The BMWs ended up fourth and sixth, confirmation that they are still the third best team and both Kubica and Heidfeld could make life difficult for the front runners tomorrow. Vettel did an amazing job in the STR to grab 7th spot, while his team mate, Bourdais, found the car almost undrivable. It was the same story with the Hondas, Button just missing the cut to get into Q3, whereas Barrichello never managed to get a decent time out of the car. Glock managed to put the Toyota into 8th and Trulli was well beaten by his team mate this time, ending up in 11th. But the Williams team did very well, taking the last top ten grid spots. Nakajima was almost a second slower than Rosberg, however, and the likelihood is that he is heavy on fuel, perhaps going for a one-stop strategy. The Red Bulls were well down the order and do not appear to enjoy this circuit. Engine power may not be the whole problem this time, with Alonso finding enough speed to be one of the quickest through the speed trap in practice. Mario Theissen reckons that too much has been made of differences in the engines of late and, on this evidence, he is correct. Force India occupied their customary position at the tail end but might have been able to do better had not Fisichella stuffed the car into the barriers at every opportunity. It never rains but it pours. So, do we get a race tomorrow or will it be another procession like Valencia? The times are close, apart from the six tenths gap enjoyed by Massa at the front, so the early laps are going to be quite hectic, I think. Much depends on how good a start the men at the front make. It does look as though there will be one big difference from Valencia, however: the safety car is likely to be pretty busy, especially early in the race. There were a number of mistakes made during practice and qualifying and plenty of places where such errors will be dearly paid for. Another factor that may come into play is the bumpiness of the track. We saw a few mechanical failures over the last couple of days and it is entirely possible that vibration levels are taxing the cars to the limit. Over a full race distance, I suspect that we will see rather more retirements than we have become used to. It looks like being a straight fight between the championship leaders but there are plenty of potential wild cards in the pack. 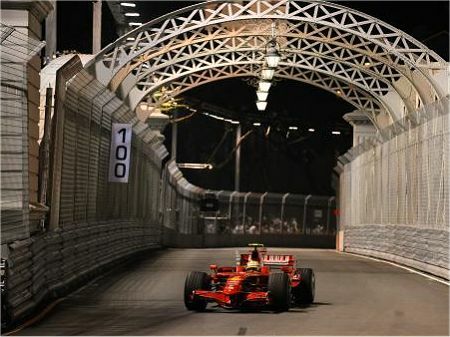 Apart from the usual things like strategy and reliability, it remains to be seen whether Kimi will assist Massa if he finds himself in the lead. That could happen if he is carrying the greater fuel load and it may be that the Ferrari pit crew have to ensure that Massa remains their prime hope for the championship. Being a Mclaren fan, the thing that really made me angry is that how could the Mclaren Team take the risk of not letting the Hamilton early enough to do a decent lap in Q2, I was really afraid that he would not quality for Q3, Just imagine the if Hamilton could not make it to Q3, I think this should be investigated within the team. Hamilton and his team will a laughing stock through out the weekend. I think now the mistakes are totally now allowed he can not get this close to the title and just blow it away by a silly mistakes that would cost him the title. I don't expect much in the way of racing tomorrow. The circuit looks like a tighter bumpy version of Valencia with a glittery backdrop and incompetent marshals. Frankly the circuit should not have a grand prix because they are incompetent and a few of us predicted precisely the problem that exists. Time to bring back the rule that a circuit does not get a GP until it has successfully put on a major international level event. I hope the race is not decided by the incompetence of the marshals.